"The Bad Hatter" / "The Secret Planet"
Wander Over Yonder returns and it hasn’t it missed a beat. Sure, it’s still in the same narrative space–Wander and Sylvia on the run while Hater attempts at winning Dominator over–but Wander doesn’t feel like it’s getting old at all, primarily by its incredibly slick animation, its comic momentum, and its genuine moments of drama and/or revelation. Wander Over Yonder is a cartoon through and through, which allows the “logic” of something like “The Secret Planet” work (particularly the sheer interplanetary destruction that is apparently that is left in Dominator’s wake), yet rarely, if ever, does the show not truly believe in its characters and their role in this absurd universe. That doesn’t apply to Dominator though, which I’m coming to terms with, I think. The show is clearly positioning her less as a character and more as an overwhelming force that Wander, Hater, Sylvia, and Peepers just have to deal with, and that’s fine, since there’s still so much we don’t know about them. Wander is the show’s most intriguing mystery, the absolute embodiment of “friendly and helpful to a fault.” Both “The Secret Planet” and “The Bad Hatter” take a hilarious but unique look at the orange traveler: the former episode focuses on his commitment to satisfying those around him (through admittedly well-worn territory), but the later takes a tiny but significant look at Wander as a whole, hat and all. I don’t mean to discount “The Secret Planet” at all. Broadly speaking, “Wander gets in over his head trying to do a thing while being nice” has been the show’s go-to story since the beginning; in fact, this episode was pretty much “The Night” by way of “The Nice Guy.” This episode allows Wander to once again go crazy in his attempt to satisfy everyone, but this time it allows him to vocally admit he was going crazy in his need to satisfy everyone, which feels like… well, I don’t want to say it’s “development,” but it does feel like him opening up a bit and acknowledging his mistake, which isn’t something Wander does often. There’s also the small but notable detail in which Sylvia, in her own way, figures out not only that there’s others on the planet (and prepares a hideout for their antics), but in generally assuming that Wander would be going crazy in order to appease so many “guests.” Again, it feels like Sylvia, to a certain extent, has accepted Wander’s behavior (I’d guess since “The Wanders”) and figured out how to work around him. (It remains to be seen whether “accepting Wander’s reckless behavior” is a good thing though). As to the actual events of the episode itself–I have to admit that I love “multiple events” cartoon episodes, where a character has to run between several events while maintaining his cover (I mean, it’s a generic sitcom trope as well, but cartoons just do it better). As always, Wander excels primarily by being excellently timed and animated, with some great, exaggerated visuals (I loved how everything was so loud and bright that apparently it could extend past the planet’s atmosphere). Even the hooded aliens, the stereotypical billionaires, and the, uh, anthropomorphic cameras were stupidly over-the-top, but as always, Wander’s absolute desire to help is infectious. When he comes clean, immediately everyone works together to remove all those massive distractions. Wander Over Yonder believes in the power of positivity, and in the end, it wins over everyone, particularly in terms of keeping everyone alive. “The Bad Hatter,” however, is focused on Wander as a person, which is odd, since the bulk of the episode is about his hat. “The Hat” revealed that Wander’s hat is a talisman that produces not what you want, but what you need, in order to reflect on one’s choices and work to become a better person (Wander speed-explains this in the middle of the episode). But to Wander, that hat is also a part of him, and it’s not just because he can use it to grab essentially whatever he needs out of it to help himself in a situation. Its significance is in how he found it, and how that discovery reveals a real connection between the wandering orange creature and the headwear upon his brow. “The Bad Hatter’s” brilliance is in how specifically it frames Wander’s disappointment in missing his hat against Hater’s cruel treatment of it. Make no mistake, watching Hater force that hat to give him what he wants is specifically uncomfortable to watch, and an important reminder that Hater is an active, vicious villain, despite his comically whiney behavior (which the hat tries to point out to him early in the episode). 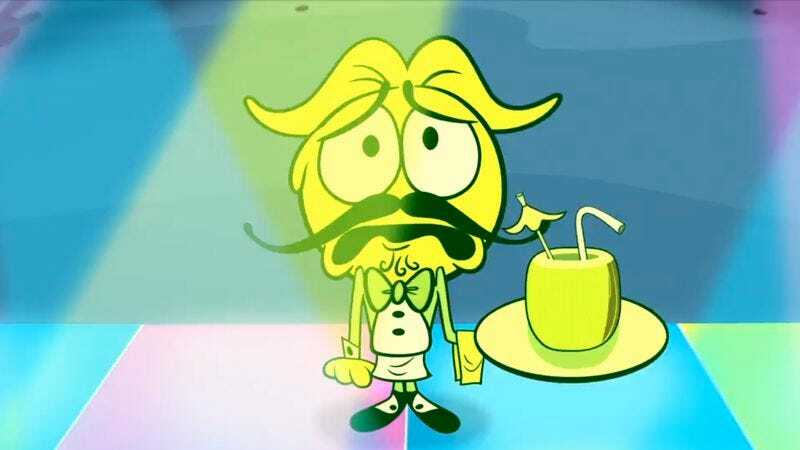 The episode goes through the typical beats–Peepers desperately trying to get Hater to ask for weapons, Sylvia trying to cheer Wander up–but everything comes to a head when Wander accepts the hat as being gone (again, feeling like a bit of growth on Wander, who normally would freak out) and admit how he acquired it. Wander stealing it is a surprise, but the story behind the theft, spoken over Hater’s and Peeper’s battle, is a beautiful, perfect moment, and not only because it leads to his and Sylvia’s badass rescue. Wander always had a good heart, and the hat knows this, and that’s exactly why they’re truly the perfect pair. Apologies for no screenshots this week, I wrote this on my iPad and bluetooth keyboard while on vacation. I’ll definitely have them next week, but suffice to say, there were so many great shots. Wander being helpful but rarely asking for help is such a great theme, and I hope the show pushes this a bit more. In fact, I really would like the show to directly go after Wander’s most over-the-top tendencies. It feels like the show wants to do it, but hasn’t quite called him out for it yet. Wander’s history is becoming more and more fascinating, and yet, I feel like revealing it would actually ruin things. That’s some top-notch writing right there.